You all know how I love to make my little granddaughter, Stella, special greeting cards, right? Well, for Easter I have created one that I hope will make her smile. Her own little Easter lamb. 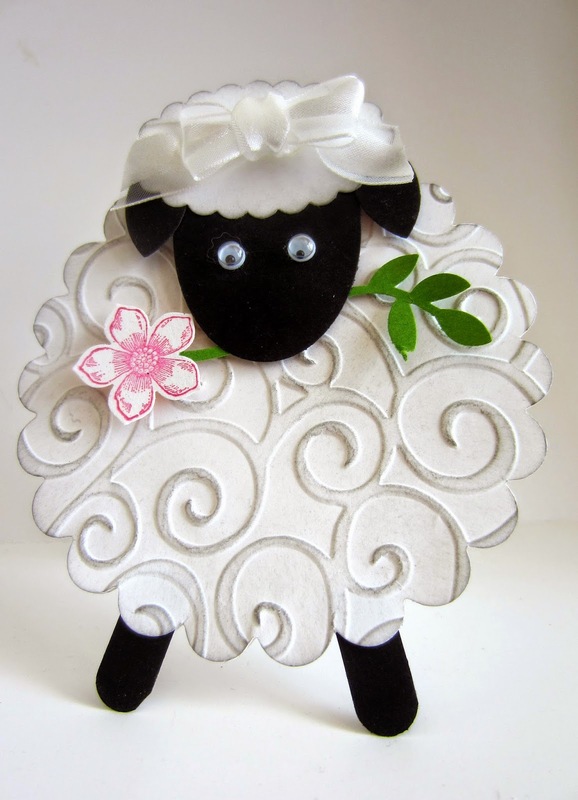 Although the little lamb is not made completely with Stampin' Up! products, the majority of products ARE from Stampin' Up! Her body is made up of a 3 3/4" scalloped circle that I ran through in a swirly embossing folder that I've had for years. It was perfect to simulate a woolly body. The body and hairdo in the simple white was not very effective. So I sponged the edges and the embossed swirls with a light touch of Basic Gray ink. That made everything seem ever so much more REALISTIC! Don't you agree? 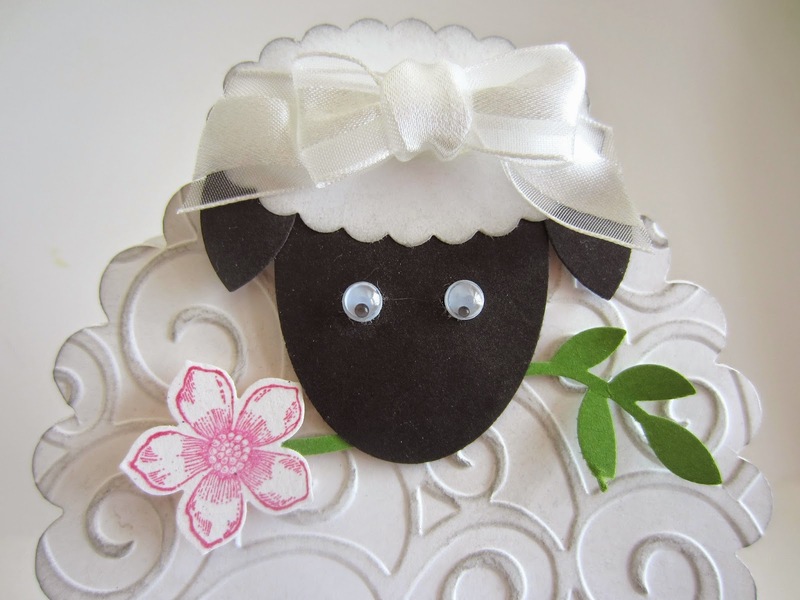 The little lamb's head is made from Basic Black cardstock with the Extra-Large Oval Punch, while her adorable hairdo is in white using the Scallop Oval Punch. Bad habit I have of grabbing something that is retired to create my projects . . . Her ears are two of the petals from the old 5-Petal Punch. However, I think equally adorable ears could be made with the wing from the Bird Builder Punch, or two of the petals from the Pansy Punch. Or the ends of the Modern Label Punch? How 'bout a Small Heart upside down? Hmmm, try the little "cloud" shape from the Word Bubbles Framelits Dies (page 36 Occasions Mini). LOTS of possibilities in our catalogs for little lamb ears! Of course, you recognize her cute little legs made with the Word Window Punch. I added a bow to her hair created with our beautiful Organza Ribbon. It's a fork bow. She somehow "told" me she was hungry, so I provided a little snack for her. A portion of the Little Leaves Sizzlits in Gumball Green was the stem for the flower stamped in Melon Mambo with the Petite Petals and punched out with the coordinating Petite Petals Punch. And, aren't those soulful googly eyes simply mesmerizing?? With her pupils downcast, she looks downright demure, right? I pinned this. You made me smile. She's so cute. I love the colors and everything. I bet Stella will love it!! I love this! It is so cute. So sweet...I love it. Thanks for sharing on the Thursday Blog Hop! That is adorable. What a great idea too. I would like to do this in felt. I wonder how it would look? So sweet! Thanks so much for sharing your creativity on at our Show-Licious Craft & Recipe Party! Hope to see more of your projects again on Saturday morning! Congratulations on being featured at Betwitch Me & Titi Link Party. Very cute! Thanks for sharing at Take it on Tuesday!! Thank you for sharing at Tuesdays with a Twist (no rules). We hope to see you back again today.